The recipe is quite a no-brainer really. All this is required is to have all the sardines mashed up and the other ingredients added into it. I’d used two eggs and more red chili as well as I like the heat. I didn’t have daon sup (Chinese celery leaves) at home so I didn’t add those. Otherwise, the recipe list remains pretty much the same as on Wendy’s blog. Wendy did her Roti John in the oven. As I said, I was too lazy to do that. So I toasted/pan-fried the slices of French loaf with some melted butter over a non-stick pan. 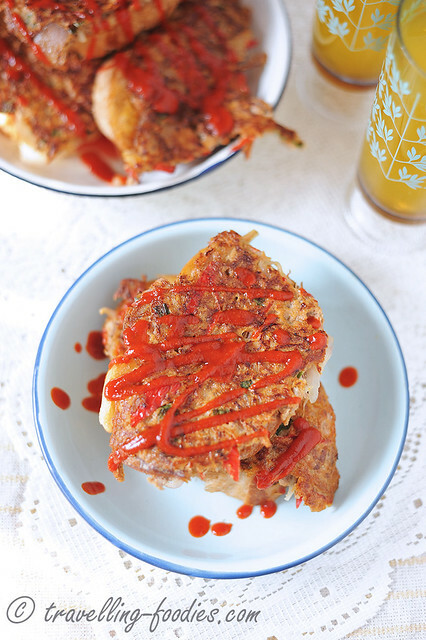 Only one side needs to be toasted as the other side needs to remain soft for the Roti John “topping” to adhere to. When the french loaf slices are nicely browned and crisp on one side, they are removed. More butter is then added in which the topping mixtureis being pan-fried. It is essentially an omelette with a lot of goodness in it! It smells so heavenly with the onions and sardines being cooked. 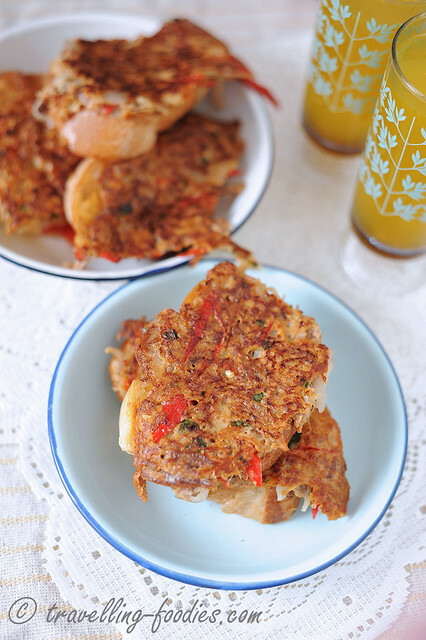 Once the omelette is slightly done, and the ingredients are beginning to dry up slightly and coagulate, the pan-fried bread slices are laid over the half-cooked omelette with the pan-fried sides facing upwards. Be sure to press down slightly so that the slightly wet omelette with stick to the base of the bread. The heat is then brought down to medium-low, for the topping to cook through very slowly. The pan should not be covered as the steam produced, if trapped under the lid of the pan would cause the bread to turn soft. So just give the omelette a minute or two more to nicely dry up on the top surface. The side facing the pan would also brown slightly and nicely crisp up. 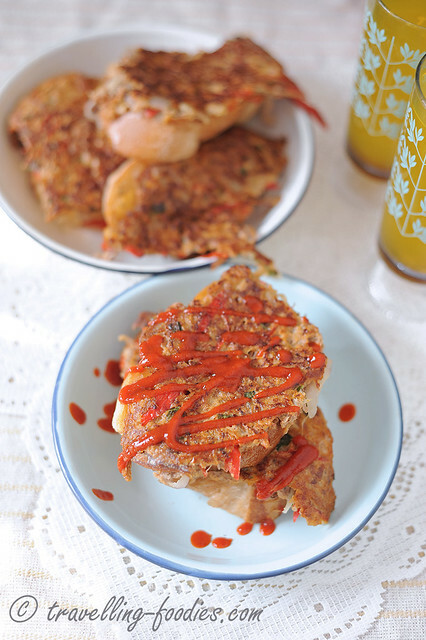 When it is done, simply use a spatula to “cut up” the omelette, around the perimeter of each piece of bread But of course there would be more abundant topping than bread of course, but that is what homemade Roti John should be about yeah? Enjoy! Heat up a flat non-stick frying pan and add 1 tbsp melted butter. 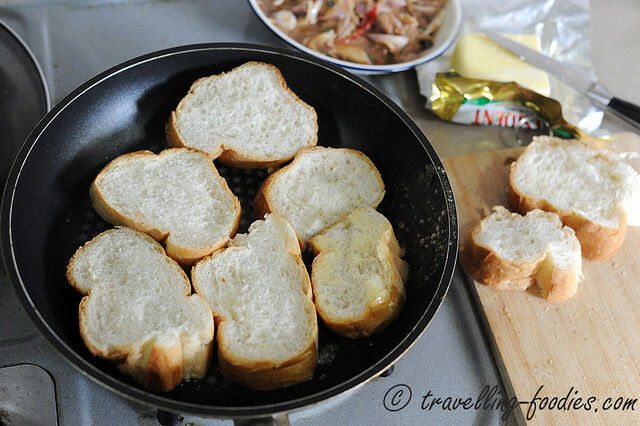 Over medium heat, pan fry the bread slices on one side until crisp and slightly browned. Remove bread slices and set aside. In a mixing bowl, mash up canned sardines first and mix in all the other topping ingredients thoroughly. To the same frying pan, add another tbsp of melted butter. Add the topping ingredients into the wok and spread the mixture to cover the whole pan evenly. When the omelette is starting to dry up slightly and coagulate, add the bread slices with the pan-fried sides facing upwards. Lower flame to medium low and cook the omelette slowly until it is thoroughly cooked through. The side facing down should turn nicely brown and slightly crisp. 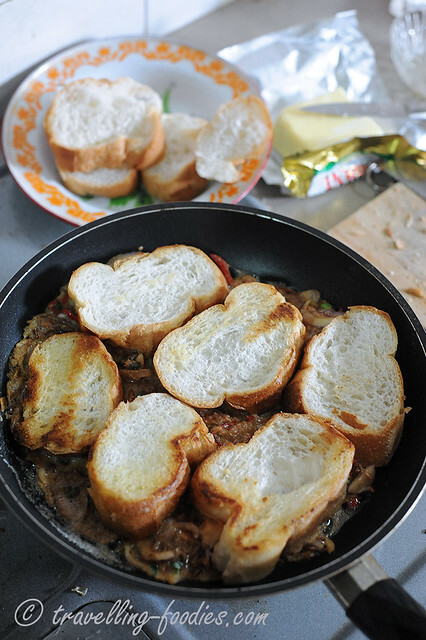 With a wooden spatula, cut up the omelette along the sides of each piece of bread. 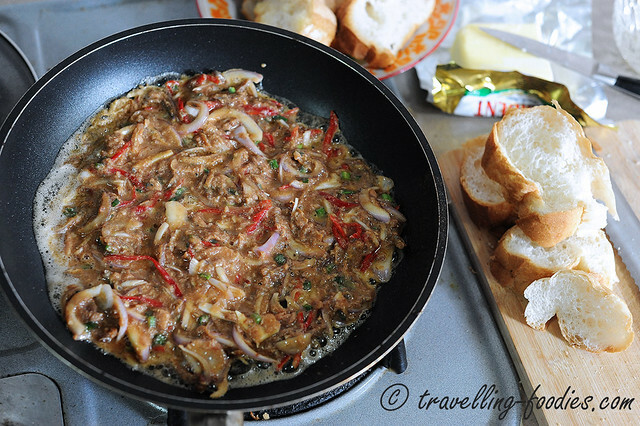 This entry was posted on October 17, 2014 by Alan (travellingfoodies). 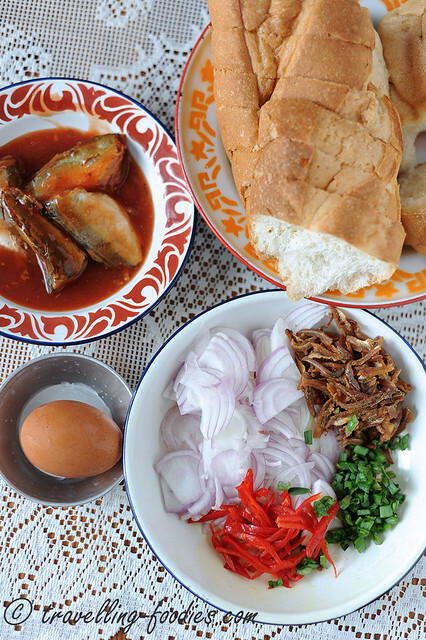 It was filed under Food, Simple Eats and was tagged with anchovies, chilies, egg roti, johor, malaysia, onions, pasar malam, roti john, roti peranchis, sardines, snack, spring onions. oh yes most certainly!!! 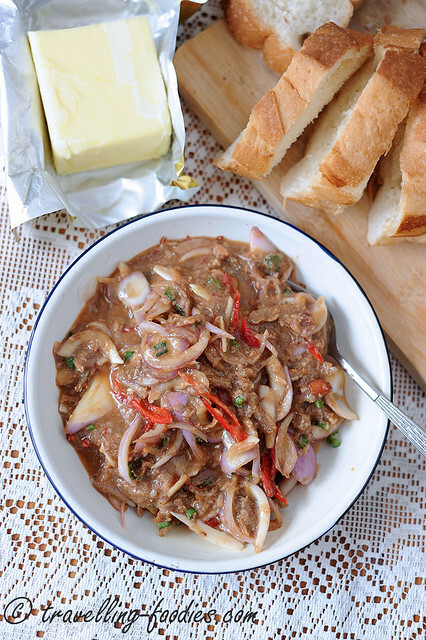 I’d tried roti john with minced mutton as well! sedapnya!